SVR Hydraliane BB cream SPF 20 is a BB cream in form of a moisturizing care which allows to moisturize the skin and to unify the complexion. It is adapted to all types of skin. 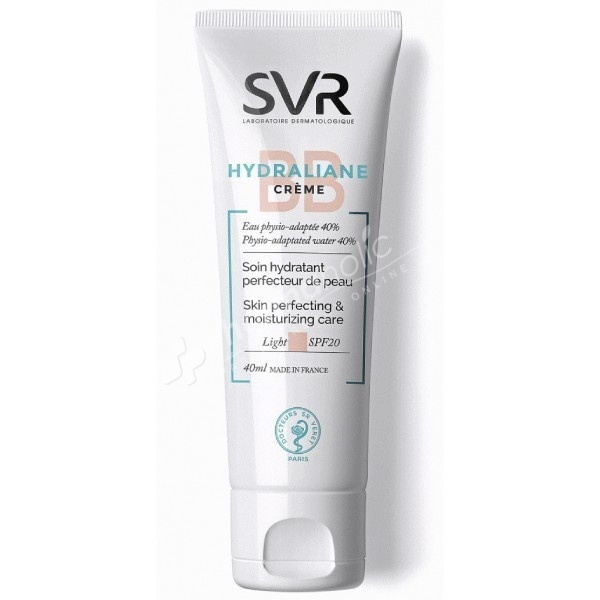 SVR Hydraliane BB Cream Skin Perfecting Moisturizing Care is a BB cream in form of a moisturizing care which allows to moisturize the skin and to unify the complexion. It is adapted to all types of skin. This BB cream provides to your skin a comfort and a moisturizing during the day. At its application, your complexion is more brilliant and unified, the skin is refined. - Physio-adapted water, which infuses continuously essential water to the cells. - Physiological sugars, which durably fix the water in the skin. - Reflecting pigments, which reveal instantly a more beautiful skin. - SPF 20 Anti UVA/UVB, wbich prevents from cutaneous photo-aging. Its texture is light and silky, and do not leaves any oily finish on the face. Available in 2 shades light and medium. Use: Apply alone or after the daily skincare cream. Aqua (Purified Water), Dicaprylyl Carbonate, Ethylhexyl, Methoxycinnamate, CI 77891, Cyclopentasiloxane, Dibutyl Adipate, Diethylamino Hydroxybenzoyl Hexyl Benzoate, Glycerin, Silica, Vinyl Dimethicone/Methicone, Silsesquioxane Crosspolymer, Beheneth-25, Bis-Ethylhexyloxyphenol, Methoxyphenyl Triazine, Glyceryl Stearate, Peg-100 Stearate, Propanediol, Hydroxyethyl Acrylate/Sodium Acryloyldimethyl Taurate Copolymer, Aluminia, Butyrospermum Parkii (Shea) Butter, Calcium Gluconate, Gluconolactone, Magnesium Gluconate, Manganese Gluconate, Mica, Saccharide Isomerate, Titanium Dioxide, Tocopherol, Zinc Gluconate, 1,2-Hexanediol, C12-16 Alcohols, Citric Acid, Hydrogenated Lecithin, Palmitic Acid, Polysorbate 60, Citrate Sodium Hydroxide, Sodium Lactate, Sorbitan Isostearate, Triethoxycaprylylsilane, O-Cymen-5-Ol, Sodium Benzoate, Parfum (Fragrance), CI 77491, CI 77492, CI 77499.